The latest food trend to hit the foodie world is totally funky. Literally. And I am not referring to the art of grooviness. What I refer to is that certain je ne sais quoi that makes you turn up your nose when you smell something a little-well maybe slightly more than little-“off.” Purposefully spoiled foods are all the rage. 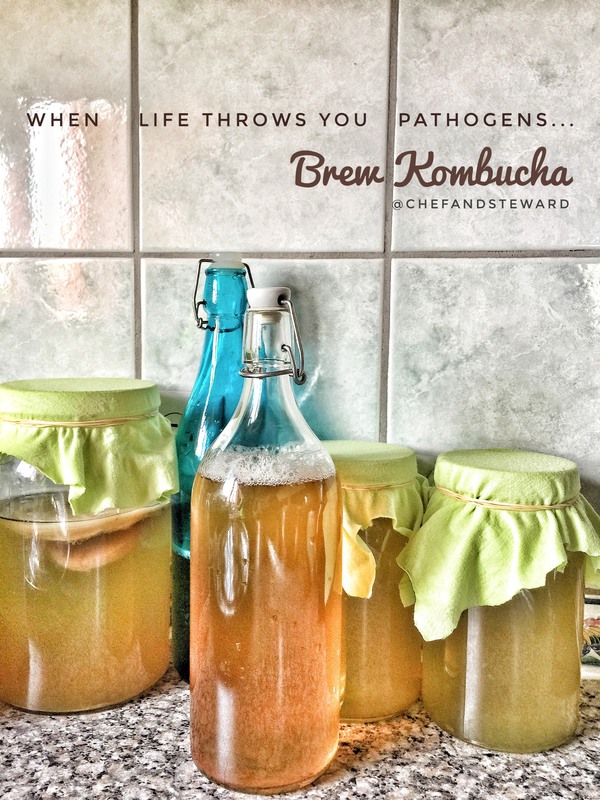 All across the world, kitchen counters of every crunchy mom (code for health and price conscious DIYers) are lined with glass jars of various fermenting foods and drinks. Yup, the latest food trend is spoiled fermented foods! Are you on social media? I am everywhere as @chefandsteward (FB, IG, YouTube, Periscope, Pinterest, Twitter). Follow me on all channels to participate in my LIVE videos. I know it sounds very weird. We the crunchy foodies are modern, convenience-loving, sophisticated people with ancient kitchen practices reminiscent of great granny’s kitchen. We? Yup, I am guilty as charged! “Kombucha, SCOBY, sauerkraut, kefir, kimchi, homemade ginger beer, fermented coconut water, fermented pickles, preserved lemons, sourdough bread, starter culters and traditional buttermilk” are all the trending buzzwords of this funky fermented foods era. As westerners catch up with the customs of old, we are breaking the internet with this return to bygone traditional ways of processing and preserving foods. Have you ever heard the good old saying “Trust your gut?” Well, according to many gut-health-conscious food experts, you really ought to. The foodie world has caught up to a truth long known in Ayurveda, Arab, Traditional Chinese Medicine and other traditional holistic cultures- feeding your gut probiotics via fermented foods is good sense. In many places, you can even buy these probiotic foods from commercial manufacturers. Since these foods are now trending, there has been an increase in probiotic food products by commercial manufacturers looking for what is becoming a very lucrative market. However, the new craze is to go back to the basics and make them yourself- or source from a small batch artisanal home-based supplier. And for good reasons. I like to make mine because I know my ingredients and can control the outcome. Plus it is cheaper and generally nature does all the work. Anything can contain probiotics but it is the live and active cultures that do the magic. When we eat, we are not the only ones at the feast. Billions of bacteria in our gut also thrive on whatever we choose to eat or drink. These bacteria are pretty much broken up into two colonies:- the good guys (good bacteria) and the bad guys (harmful bacteria). It is the choice of our food and beverage intake that feeds either colony. The aim is to purposely feed the good bacteria through foods and beverages with probiotics and prebiotics. The more of those substances in our daily diet, the more we encourage the growth of the good guys, and the demise of the bad guys. It is simply survival of the best fed. Diets comprised of lots of raw foods, probiotics, prebiotics and less added sugars and simple starches allow good gut bacteria to thrive, while diets lacking these things and high in sugars and simple starches cause the bad gut bacteria to thrive. I have big plans for my kombucha. And I plan to try my hand with other fermented foods and drinks as well. Let me know which ones you have had or would try your hand at making. kombucha: A fermented fungus tea drink said to have been originated in Manchuria somewhere between 200-2000 years ago. 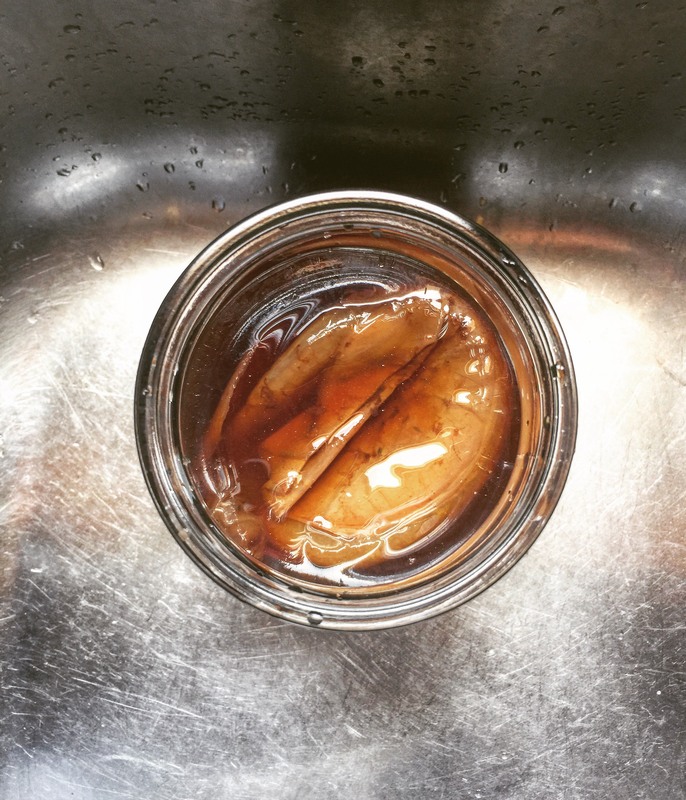 SCOBY: This is the fungus or “mother” starter fungus created during the kombucha brewing process. The word is literally an acronym for Symbiotic Culture of Bacteria and Yeasts. YUM. sauerkraut: Fermented cabbage made popular and modified in Central and Eastern Europe but originally from China. Known as a topping for hotdogs and other Eastern European dishes. kefir: Fermented dairy drink made with kefir “grains”, which is a yeast fermentation starter. There are two types of kefir grains, milk kefir grains and water kefir. kimchi: Traditional Korean way of preserving cabbage during the winter months. It is very spicy and tangy and an essential condiment in Korean cuisine. 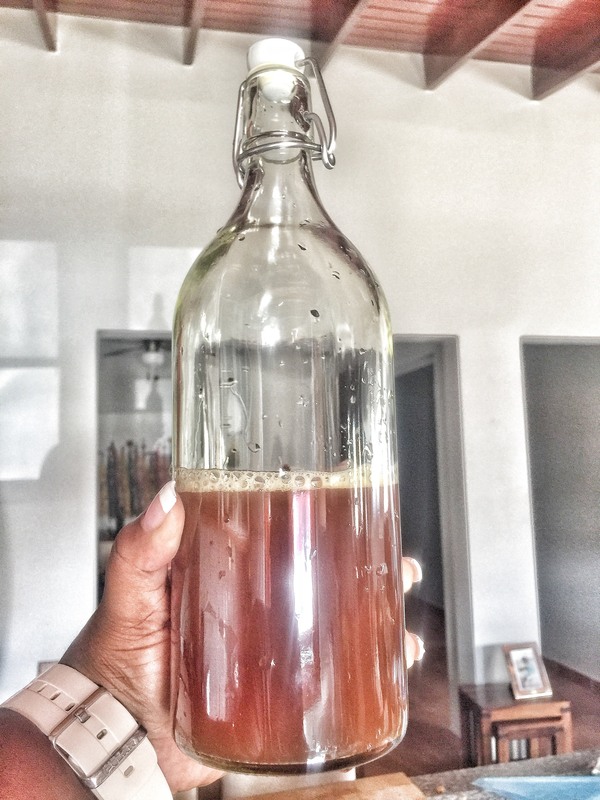 homemade ginger beer: The traditional Jamaican process of converting ginger, water and sugar into a fizzy fermented drink with as much or little sugar as you like. fermented coconut water: Taking coconut water and deliberately allowing it to go off to create a fizzy, slightly tangy, probiotic drink. fermented pickles: Not the vinegary type, these are water and salt based and fermentation comes from allowing the natural lactic acids in the cucumbers/gherkins to take over. sourdough bread: Bread made with a probiotic starter that makes the loaf sour to taste and even more tolerant for some who may not tolerate gluten easily. traditional buttermilk: The traditional way of creating buttermilk, allowing milk to ferment into a thicker consistency and souring a bit. It is similar to laban.